The final piece is getting Wine Test Daily to run automagically. That means, it should run when I'm not here, whenever Wine has been updated. Sure, I can reach over and start all of the tests on each system here at CodeWeavers every day when I appear at work but the fact that I can have my systems setup to do it for me is more than appreciated. It's one of the best features of wt-daily, it checks to see if it needs to run. It stores the last git commit number in a file and whenever it's called, it compares the current git commit with the last one it used. If they are different, wt-daily runs a new set of tests. WineHQ gets commits a little after I arrive at work. I'm happy to manually start the tests but often times losing my Macs for an hour to automatic tests is bad. I've setup the tests to take place after I leave for the day and am pleased to report that those tests have run overnight successfully several times. This part will be more technical on the Mac OS and only have a little work to do with wt-daily. Let's finish setting up wt-daily first. desc="OS X 10.11 dual GPU AMD Radeon R9 M370X and Intel Iris Pro with the X11 driver"
descmac="OS X 10.11 dual GPU AMD Radeon R9 M370X and Intel Iris Pro with the Mac driver"
exlude="ddraw:ddraw1 ddraw:ddraw2 ddraw:ddraw4 ddraw:ddraw7 user32:win"
Note that the dwrite:font test has already been fixed and the developer notified me as soon as the fix was in place, hooray! I need to add an option to automatically run the tests when wt-daily is started. I need this because the tests are very polite and on launch ask if the user is ready to run them. Wt-daily is now configured to run with an automatic setup. The easiest part of the OS X setup is to schedule a wakeup time for the Mac that won't interfere with normal workflow. 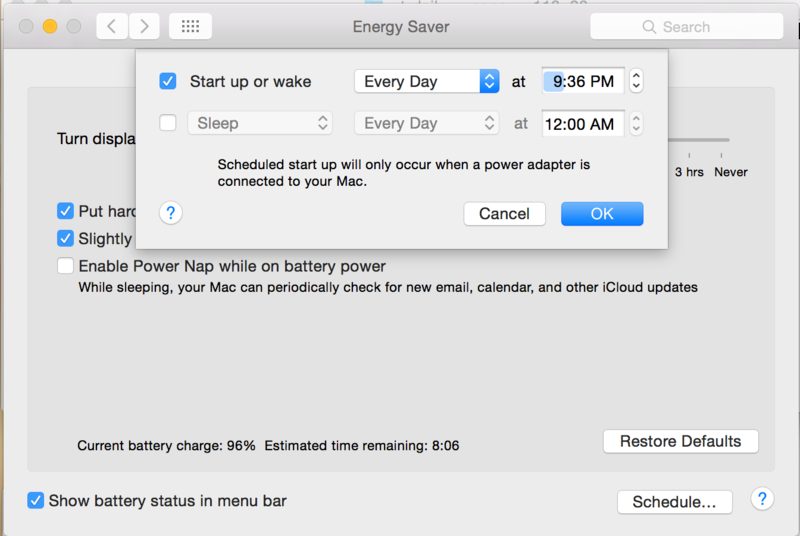 Open System Preferences and choose the Energy Saver. In the bottom right corner, click "Schedule…". Schedule a time when the Mac will be free for roughly an hour. And now, the technical part. Convincing the Mac to run wt-daily at a specific time. Reading that was an ah-ha moment. I wanted that. I wanted the job to run on wakeup if - for some reason- it failed to run. Then, create a file with the extension ".plist"
Make changes and load the file again. When I first got this running, I did a lot of experimenting. I set the script to run two minutes in the future and waited to make sure it would run. Now I'm really pleased with the outcome and I'm on my way to having all of my systems set to run wt-daily every day. See? There is already a block where we've run Mac tests every day there was something available to test. Anyone up for a beer? Caron has been working in the computer software industry for over 10 years. She joined CodeWeavers in 2008 and became the Quality Assurance Manager for CodeWeavers in 2009. Contact Caron at caron@codeweavers.com and learn more about her professional accomplishments on LinkedIn. This is pretty cool. What do you do with the results of the tests? Are the failures triaged and assigned out, perhaps by area of failure, or is this used internally to benchmark failures in changes CodeWeavers makes against upstream to prevent regressions? Right now, we're stabilizing the tests (and the XQuartz project just put out an update so we're updating all of our systems). In the future, each test that has failures will ideally be looked at to see if the test is too stringent or if there is another reason for the failure. Today, we ran tests and found that several were resolved by the update to XQuartz, in fact, there's a group that timed out previously that now passes. Hooray! We also look to see if there are regressions. Usually, every patch is run through WineTest when it is submitted to wine-patches and if it causes a problem, it is flagged for review by the author. 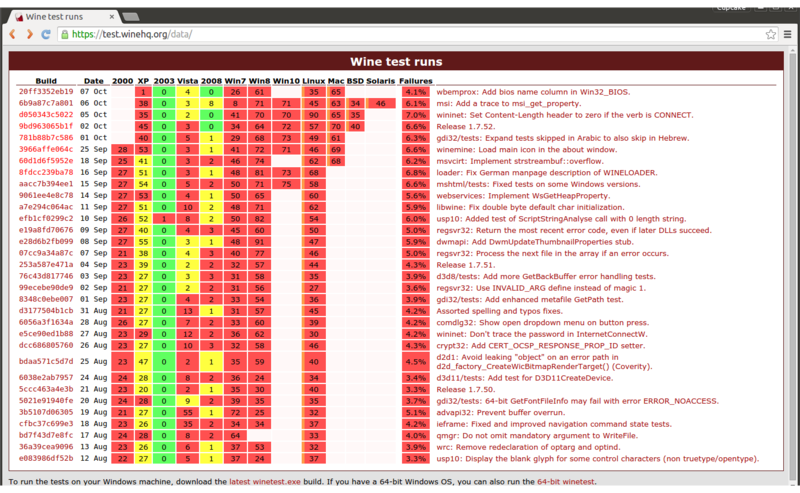 Sometimes, WineTest's bot doesn't find the regression and the test results will instead show it. That information is useful because we (anyone adept at Wine) can go back and look at what was committed to the test that day to see if there's something causing the failure. Essentially, it's a useful tool that helps. It isn't the only tool, but it is one of many.